In the past week, thanks to TV and radio commercials, the chilly weather and knowing that this week includes “Giving Tuesday,” I have been gently prodded into thinking about what gifts I might give for the upcoming holidays. Of course, my favorite gifts to give are books. Virtually every book could make a terrific gift for somebody, so the makes every visit to a brick and mortar bookstore visit or an online bookseller’s website a wonderful opportunity to play matchmaker. Yet choosing books for others, much like choosing a partner for someone else, can be a risky business. I recently read that soon there will be 150 million book titles available around the world from which to choose at any given time. That’s a big number and likely means we’ll never run out of book choices. It also means the matchmaking process as it relates to gifting books will become more lengthy and complicated. Being a lifelong teacher, the same considerations I make for determining what lessons kids might respond to at a particular time go into choosing a particular book for them. I try envisioning the influence of books, predicting the recipients’ enjoyment and thinking how the book’s content might fit into in their conversations. In hopes of finding some tips beyond my own experience, I searched the Internet for “Choosing a gift book” and found some nice coaching on this matter. Most of it focused on knowing the recipients and their personal tastes in general, and their book preferences in particular. Basically, if we can find out the last good book someone has read, we’re halfway there. There also is reliable expertise available in classrooms, libraries and bookstores. Those who know their way around books are likely to be expert in all matters related to books, particularly for their own areas of interest or people they know. If such an informant knows a person on my list, they are my first stop when trying to zero in on a gift book for our shared acquaintance. But sadly, some folks really don’t ever want to read a book. That’s good to know for gift giving, too, because it offers an opportunity to give them a very carefully well-chosen book—one the is about a topic they like and is at a level they’re ready for—that might spark their interest in reading. What a gift that would be! So this holiday season, remember that a book is a gift the receiver can open again and again. Give generously. Our minds are running on the same track. 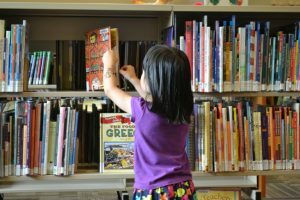 I just submitted my president’s message for the oregonread.org website and it is about the gift of books. I hope you receive a great book as a gift this season!